Our official name is Finlandia University. FinnU is an approved abbreviation. This is to be used after our official name or for use on social media. The Finlandia University logo is type-based and simplistic in nature. Below are approved copies of the Finlandia University logo. If you need a specific size, file type of the logo or have questions about which copy is appropriate for your use, please contact the university communications staff. To save one of these files, either right click and press “Save Image As” or drag it to your desktop. These two versions should be used in all media where color is present. Either option is acceptable as long as it is clear and legible. The following versions should be used in all media where ink options are limited. All Finlandia logos must be scaled proportionally when being resized. The minimum sizes for the all version of the logo are based on the legibility of the icon. The smallest the icon size should be is .75” high. 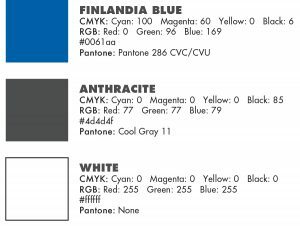 The official colors of Finlandia are Finlandia blue, white and Anthracite. Secondary colors, including other shades of blue and grey as well as contrasting colors, have been identified and will be displayed in this drop down shortly. Always use the colors specified to ensure brand consistency. CMYK: Used in four-color printing, it stands for cyan, magenta, yellow, and black. RGB: Used in virtual spaces like video, tv, and monitors. #: Numbers used to specify color on web pages. Pantone: Used in a variety of industries, primarily printing, though sometimes in the manufacture of colored paint, fabric, and plastics. We will be posting many items here that will be useful for those managing content on our website.